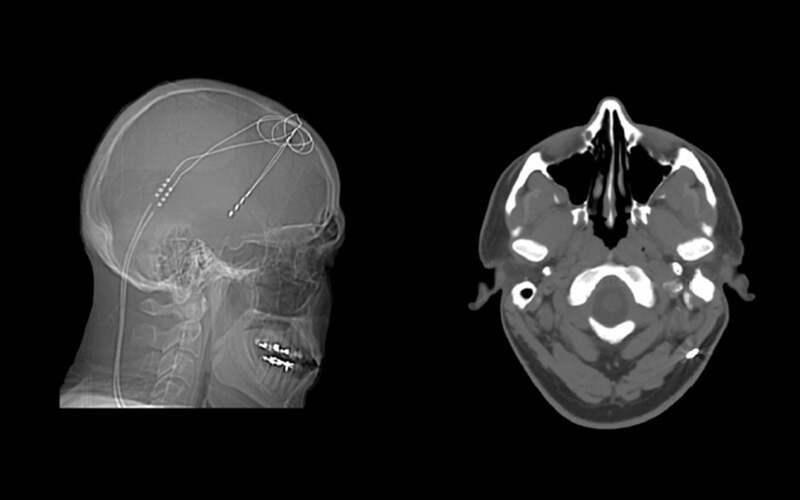 The patient recruited in the study, a 37-year-old male, received surgery to implant two deep brain stimulation (DBS) probes, visible in left image. Electrical stimulation almost completely eliminated symptoms of previously disabling severe obsessive-compulsive disorder and enabled the patient to return to work, meet a spouse and get married. Precision medicine is an approach to diagnosis and treatment that tailors therapeutic care to individuals in a highly specific manner, and which brings to bear powerful new technologies that have not yet made it into the mainstream of clinical medicine, in part because they remain unproven. Gholson J. Lyon, M.D., Ph.D., a CSHL researcher in molecular genetics and also a practicing psychiatrist, and collaborators at the University of Utah, the Utah Foundation for Biomedical Research (UFBR) and the companies Omicia, Inc. and AssureRx, report on their recruitment and treatment of a single patient with severe psychiatric illness. The man, identified as a 37-year-old U.S. military veteran, suffered from a form of obsessive-compulsive disorder (OCD) that rendered him completely disabled—profoundly compulsive and anxious, occasionally paranoid, and unable to hold a job or form meaningful relationships. Over the past three years, the team successfully treated the man with an experimental form of electrical brain stimulation, called deep-brain stimulation (DBS). To date, DBS has been used most frequently to lessen symptoms in people with advanced Parkinson’s disease and also on an experimental basis to help lift otherwise untreatable, severe depression. Worldwide, only around 100 other people with OCD have been reported to have received DBS treatment on a trial basis. This was the first such instance, however, in which an individual with such severe mental illness, being treated with DBS, also consented to and received whole-genome sequencing, and rigorous post-sequencing analysis of the results, accompanied by genetic counseling. Each phase of the study generated significant data; but never had such data been integrated in the context of a single clinical psychiatric case. The results, which appear online today in the journal PeerJ, show that the patient was greatly helped by DBS. Over the treatment period, symptoms associated with OCD diminished to the point that the individual was able to “regain a quality of life that he had not previously experienced in over 15 years,” Dr. Lyon and colleagues report. As the electrical stimulation of his brain via DBS was optimized over time (this involved gradually increasing the voltage used in electrical stimulation), he was able to participate in regular exercise, work as a volunteer, and eventually meet someone and get married. The researchers noted that several times during the treatment, when power from the battery that drives the DBS signals was either drained or not activated by the patient, symptoms of severe OCD returned over the course of 12-24 hours and rapidly became debilitating. This was both a powerful lesson to the patient to keep the device charged (the battery is rechargeable) and vivid evidence to the scientists regarding the device’s role in producing the patient’s observed symptomatic improvements. Whole-genome sequencing, meantime, revealed that the patient carries at least three gene variants, or alleles, that have been associated in other studies with neuropsychiatric illness. These variants were in genes that encode proteins called BDNF, MTHFR and ChAT. The BDNF gene variant is of particular interest. Its protein is a prime growth factor essential in the early development and subsequent healthy function of the brain and nervous system. The other two variants have also been associated in past studies with possibly increasing the risks of mental illness. Other gene variants were found that have implications for the way the patient is either able or unable to metabolize particular kinds of drugs. These and literally thousands of other bits of personal genomic information had no immediate impact on his treatment or prognosis, but were archived by Dr. Lyon’s team in the hope that at some later date they might be useful. One of the gene variants did prompt a referral for an eye exam, which revealed bilateral cataracts and poor night vision in this person, which the investigators are currently following up. “Although we believe in archiving and managing all genetic results and not just a small subset of presently-known ‘risk genes,’ we did analyze the 57 genes in our subject’s genome that are currently recommended for ‘return of results’ to patients by the American College of Medical Genetics,” Dr. Lyon and the team notes. The inability even to enter the data in existing electronic health record databases points to the practical problems that remain in using comprehensive data sets to help evaluate and treat patients in a clinical context. The research described in this news release has been supported by grants from the National Institutes of Health and the Stanley Institute for Cognitive Genomics at Cold Spring Harbor Laboratory.